Low inventory and quickly rising home prices have been the name of the game for a while now, causing homebuyers to consider moving to new neighborhoods, cities and even states that offer greener (and more affordable) pastures. Redfin recently released its list of 25 neighborhoods that “have it all,” which revealed where buyers are getting the most bang for their buck, and Chicago neighborhoods dominated the list, taking 14 of the 25 spots. Affordability: Zip codes were selected that had a median home sale price below the national median of $291,700*. Home Selling Speed: Several months of falling inventory and strong demand mean the most desirable homes go off the market within days of being listed. Selected zip codes had a median days on market of at least 46**. Highly Rated Schools: Neighborhoods with a GreatSchools rating of 5, which is considered average, or higher were chosen. Transit: Neighborhoods with a Transit Score of at least 50, indicating many nearby public transportation options, were included. Low Crime Rates: Using crime data from BestPlaces, our ranking favored places with lower reported violent crime. Chicago’s Dunning neighborhood came in at no. 1, thanks to a $256,000 median home sales price matched with good inventory (263 homes for sale in December 2017), 76 median days on market, a slightly above average school ranking (6.6), good public transit access (55.4) and a low crime ranking (35). Ashburn, Jefferson Park and Elmwood Park helped round out the top five with Oak Park, Wrigleyville, West Ridge, North Park, Edgewater, Andersonville, Lincoln Square and Belmont Gardens also making the list. Pittsburgh’s Squirrel Hill nabbed the no. 2 spot, mainly due to the $175,000 median home price and healthy jobs market fueled by Google, Uber and Carnegie Mellon University. Redfin called upon agent Alex Haried to give some insight into Chicago’s high rankings. According to Haried, it’s the city’s high local tax, which funds public transit and public schools, that earned the city it’s top spots. Inman has reached out to Redfin for additional thoughts on the Chicago area dominating this list and will update this story when we hear back. 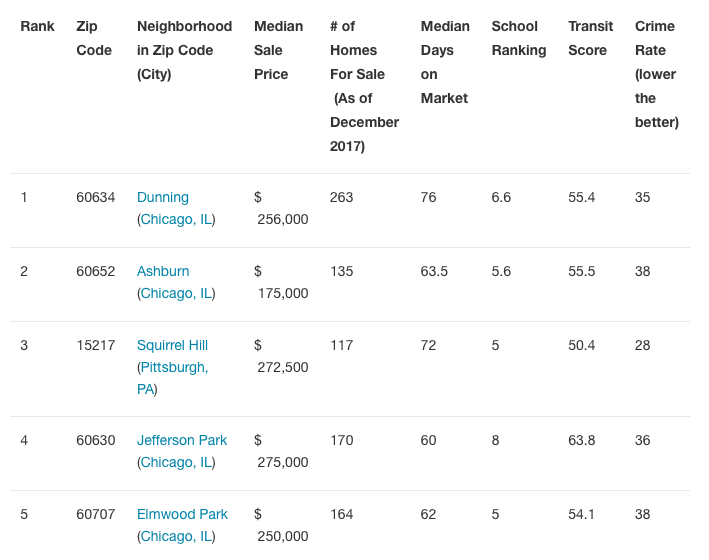 The analysis rated ZIP codes across 80 markets according to median sale price and median days on market in November according to the Redfin Real-Time Housing Market Tracker, as well as Transit Score from Walk Score and school ratings from GreatSchools. The final ranking was determined by ranking ZIP codes according to each criteria described above, along with crime rates from the “violent crime scale” on BestPlaces.net, and then taking the average of all those rankings to rank order the top 25 ZIP codes. Local Redfin agents assisted in identifying the neighborhood name that most closely matched each zip code.